Yesterday we had a time lapse of both One South and Centerra. Today we have two close up shots of the construction progress from Shawn Mathew. Both buildings are really coming along nicely. As a reminder, each of these has retail on the ground floor. Centerra has the potential of being an extension of the San Pedro Square Market. One South is a couple blocks away, but should do wonders to help activate Santa Clara Street while also contributing to what is happening in the San Pedro Square area. Coming up on the horizon, the "sibling" Silvery Towers in the San Pedro Square area right behind the Fallon House and the Post Tower right next to the Gold building. 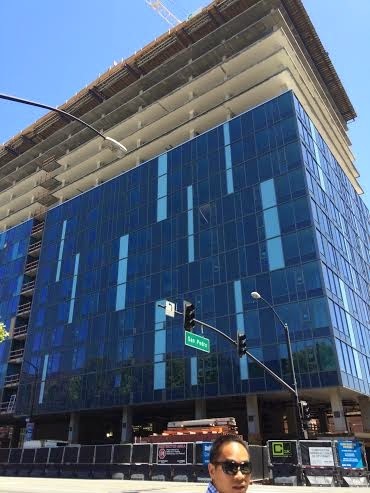 By then we'll also have the new courthouse building, the SJSU student housing tower mentioned yesterday, the Pierce in SoFA, a couple projects around St. James, and who knows how many others. 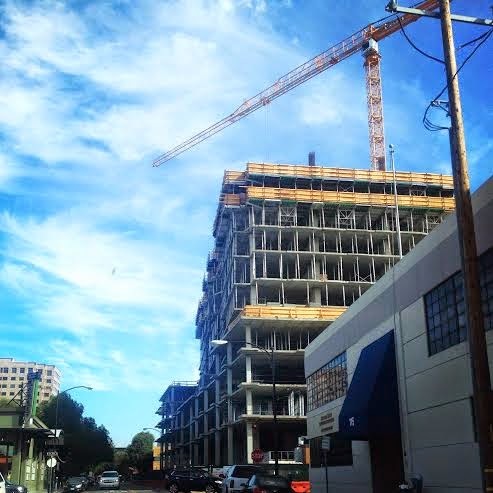 Downtown San Jose is going to look very different 3 years from now. Wow, looks just about topped off! They are pouring the roof deck this week. Last week, they had a celebration after raising the green cement crane one last time. Spaces are too small for those types of retailers and no enough foot traffic (yet).